As I write this, I'm sitting in the control room for the big Keck telescope in Hawaii, looking for methane in the atmosphere of our family planet, Pluto. 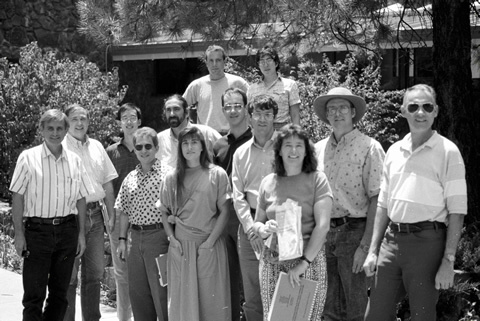 Leslie and Eliot Young (back row) and a group that includes current New Horizons team members Dale Cruikshank, Andy Cheng, Alan Stern, Bill McKinnon, Fran Bagenal and Marc Buie at the first Pluto science conference in 1993. The meeting, held at Lowell Observatory in Flagstaff, Arizona – where Pluto was discovered – helped to shape the case for a Pluto mission. How did I get a “family planet?” It started in 1987, the summer after my senior year in college. I was looking for a job. My brother's boss at the time, Jim Elliot, of the Massachusetts Institute of Technology, was looking for a programmer. Macintoshes and graphical interfaces were a fun new thing, and my brother, Eliot Young, talked me into trying to write a graphical optics bench. This turned out to be one of many times that my older brother talked me into some wild but fruitful scheme. As Eliot tells the story: Jim overheard us working, Eliot recommended me as the programmer, and I got an interview. So, I joined Eliot at MIT. For graduate school, Eliot mostly made maps of Pluto with Rick Binzel, and mostly worried about its atmosphere with Jim Elliot. The late 1980s and early 1990s was an exciting time for a young astronomer to be studying Pluto, and Eliot and I both continued to study Pluto throughout our careers. What is it like working with your brother? There are the obvious things, like our mother calling her dog "Pluto." We make travel plans together for meetings. We're probably punchier at the telescope than other observing partners. Then there are the more subtle things, like watching out for each other. We introduce each other around, spot interesting papers or opportunities for each other, and generally egg each other on. Most importantly, we are willing to talk about Pluto anytime, anywhere. Leslie Young, from the Southwest Research Institute, is a New Horizons deputy project scientist and leads the mission's Pluto Encounter Planning effort. She's an expert in observational astronomy and surface-atmosphere interactions who has been studying Pluto her entire professional life.